Meet the latest “it” couple: Smarketing. 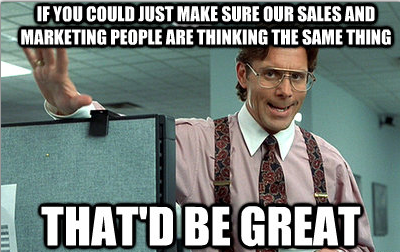 It’s pretty typical that a company’s marketing department and sales team operate independently. If this is true for your business, it’s probably hurting your bottom line. Enter the concept of “smarketing”. Successful lead nurturing and conversion relies on coordination between both the marketing and sales teams. Think your respective groups could stand to communicate a little more? Check out these tips for sales and marketing alignment. Discuss the day-to-day tasks and issues for each group. Develop a common internal language. Agree on the definition of a quality lead. Agree on the definition of a sales-ready lead. 2. Implement a lead scoring system. In order to utilize a lead scoring system, both teams need to establish a set of criteria that distinguishes Marketing Qualified Leads (MQL) from Sales Qualified Leads (SQL). Next, your teams need to determine a threshold that signals the hand-off from the marketers to the sales force. This way, no leads are dropped and no time is wasted. 3. Set goals for both teams. How many MQL’s are generated each month? How many actually turn into customers? From here, look at how your marketers are going to nurture the MQL’s and push them down the sales funnel. This is where workflows become relevant and can really boost your sales numbers. If you don’t look at the numbers, you won’t know if your strategies are working. By taking a proactive approach, you can adjust your practices and address glitches before they turn into major problems. By efficiently passing accurate information between the teams, you can strengthen your campaign, close more deals, and, ultimately, boost your bottom line. It might be helpful to think of the relationship between sales and marketing as a marriage. And one essential component of a successful marriage is open communication. So, don’t limit interactions strictly to team leaders or senior-level executives, but, instead, encourage participation from all levels of your teams. With consistent, meaningful communication throughout a campaign, you can more quickly identify the root of potential problems in the sales cycle. It only makes sense that since the sales team knows what closes deals that they would provide valuable insight into how your marketing department can curate more effective content, right? Add these practices to your current inbound marketing strategies and your sales cycle is sure to decrease dramatically. So, how does your company rate in terms of “smarketing”? For more information on how to align your sales and marketing, contact PCR for a free analysis.